When I was educated as a psychologist, in the 1980's, the dominant way of thinking in psychology tended to what we would now call a fixed mindset. Roughly, as students, we were taught that both intelligence and personality are hardly malleable from a certain age on (say, 18). Personality was roughly defined as the whole of stable behavioral tendencies of individuals. It was thought that individual differences in personality were relatively stable and also meaningful, for example for how we should make career choices. Personality: stable over situations and time? The word stable referred to two things. First, it was thought that personality traits were stable over situations. In other words, that in different situations we would tend to behave similarly because of our personality traits. Second, it was thought that personality was stable over time. This meant that personality was thought to not change much over a lifespan. That personality is stable has been questioned since the beginning of the 1970s by Walter Mischel who did research which suggested that situations have a strong impact on how we behave. Within psychology there is a name for the tendency to systematically (yet unconsciously) overestimate the influence of personality and, at the same time, underestimate the influence of situations on our behavior: the fundamental attribution error. That personality is stable over time has become more doubtful, too. 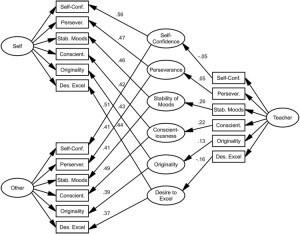 Previous research suggested a moderate to strong stability of individual differences in personality (also see this research). In a new study by Harris et al. (2016) personality assessments of 14 year old children, dating from 1947, were compared with personality assessments and self-assessments of these same people at age 77. A moderate association was found between the assessments and self-assessments of the people at age 77. But there was hardly any association between the personality assessments of the 14 year olds and the 77 year olds. The supposed stability of personality over time was mentioned by some as an argument for the statement that personality can hardly be changed. I never found that to be a strong argument. That a characteristic in a large sample does not change much does not prove it cannot be done. The majority of the people may not have tried to change it or those who have may not have used an effective approach. In other words: observed stability does not prove unchangeability. But now it seems that even this stability argument cannot be used anymore. In this sample personality was unstable and we do not have any reason to suspect that these people have systematically tried, more than people in general, to change their personality. In this post I show what such a systematic approach to changing personality might look like. I suspect more and more that personality is much more malleable than I was taught. It seems there is now compelling evidence that personality is relatively stable in the short-term and relatively unstable in the long-term. Are you aware of any similar studies on intelligence?